Raise of hands. How many of you use EDSITEment? How about ThinkFinity? When I ask teachers around the country this question, I often get a bunch of blank stares. If you do use these two sites, sweet. If you don’t, you need to jump on board. Cause they’re both awesome sites for teachers. ThinkFinity has a very nice search engine that focuses on just nine educational websites – so instead of getting tons of results from a site like Google, you get nothing but educational goodness. You can search by keyword or state standards, by grade, and by content area to get all sorts of lesson plans, activities, and handouts. So . . . separately, the two sets are both places you need to spend some time. But here’s the good news – they’re working together. Yup. Double the flavor, double the fun. The EDSITEment people have started a blog on the Community section of the ThinkFinity site. Titled Closer Readings, it focuses on, well . . . Common Core close reading goodies. 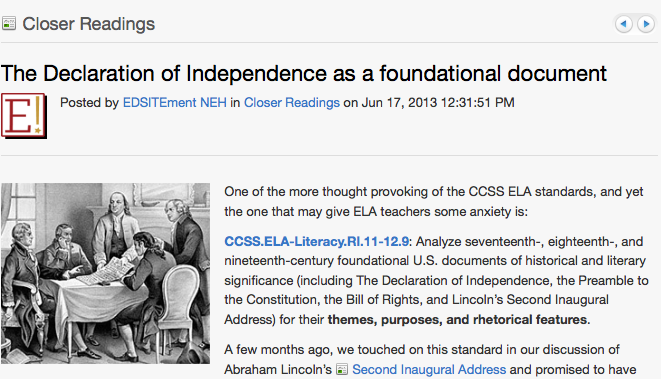 Recent posts talk about using Pearl S. Buck fiction pieces as part of your instruction and the Declaration of Independence as a foundational document. So if you’re looking for ideas on how to incorporate Common Core literacy pieces into your classroom, Closer Readings is a great place to start.